Lindsey K. Ham Sr. is sick and tired of scientific lies. For him, the truth does not change just because someone does not believe it. He believes that there was no spontaneous big bang, and life does not exist by some theoretical, spontaneous, evolutionary, purposeless process. 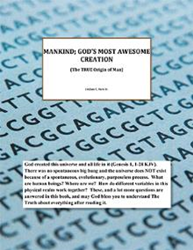 This belief prompted Ham to write “Mankind: God’s Most Awesome Creation (The True Origin of Man)” (published by Xlibris). For more details about the book, please visit https://www.amazon.com/dp/1499003900. According to Ham, the book summarizes some of the major truths about mankind, the earth, space, the universe and the physical realm vs. the spiritual realm. In it, he wants readers to think critically about God that he is indeed real and he created this universe and everything in it, including all life. “A lot of modern scientists reject the fact that God created this universe, and they are being used by Satan (our sworn spiritual enemy who has already been sentenced by God Almighty to eternal damnation) to confuse physical truths which clearly can only be attributed to God The Creator,” Ham says. Ham hopes the information he shares in “Mankind: God’s Most Awesome Creation (The True Origin of Man)” has meant something to readers. “I hope you went through it and thought critically about it. Jesus, The Christ, from Almighty God was here alright, and He’s coming back here just like He said He would. He has already told us the world would not believe on Him and so be it. The truth does not change just because someone decides not to believe it so do not be one of them. This is all way bigger than any of us. Keep learning!” he concludes. By Lindsey K. Ham Sr.
Lindsey K. Ham Sr. is a multi-talented audio/visual artist as well as a U.S. Army combat veteran. Xlibris Publishing, an Author Solutions, LLC imprint, is a self-publishing services provider created in 1997 by authors, for authors. By focusing on the needs of creative writers and artists and adopting the latest print-on-demand publishing technology and strategies, we provide expert publishing services with direct and personal access to quality publication in hardcover, trade paperback, custom leather-bound and full-color formats. To date, Xlibris has helped to publish more than 60,000 titles. For more information, visit xlibris.com or call 1-888-795-4274 to receive a free publishing guide. Follow us @XlibrisPub on Twitter for the latest news.